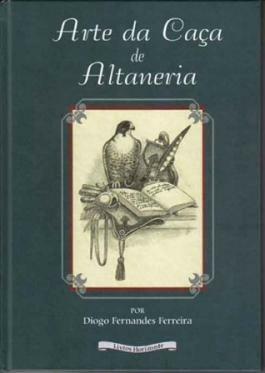 This is the most famous treatise of falconry in Portugal. The Art of altaneria Hunt, Diogo Fernandes Ferreira, was published in Lisbon in 1616. This is a work that deals with detail knowledge at the time relating to falconry is now considered an ex-libris of seventeenth-century literature, a testimony of the traditions at the time. The author would seventy when his book was published. From what we know Diogo Fernandes Ferreira was pagem Mr. D. Antonio Prior of Crato, and created in your home from an early age. It is thought that was born about 1546. Hunt Art altaneria, addressed to Don Francisco de Mello, Marquez de Ferreira, Earl of Tentugal, etc. It is divided into six parts. Edited in Lisbon by Jorge Rodrigues 1616. 4 of the VI 118 sheets numbered in front, apart from the index at the end. Brings in principle a warning of Art words, and the meaning thereof. Recently the APF re-edited this treaty can be purchased in our shop. <-- 75 Jaar Valkerij "Adriaan Mollen"